Talmadge Gateway is one of eight projects that are part of the San Diego Housing Commission’s $29.8 million homeless action plan Housing First. ​SAN DIEGO - Fifty nine seniors with ongoing medical problems will be saved from homelessness as they move into a new Talmadge complex that officially opened Thursday. Best yet, it’s a permanent home for Pastore, and a step up from the downtown temporary housing he had called home for the past year and a half. 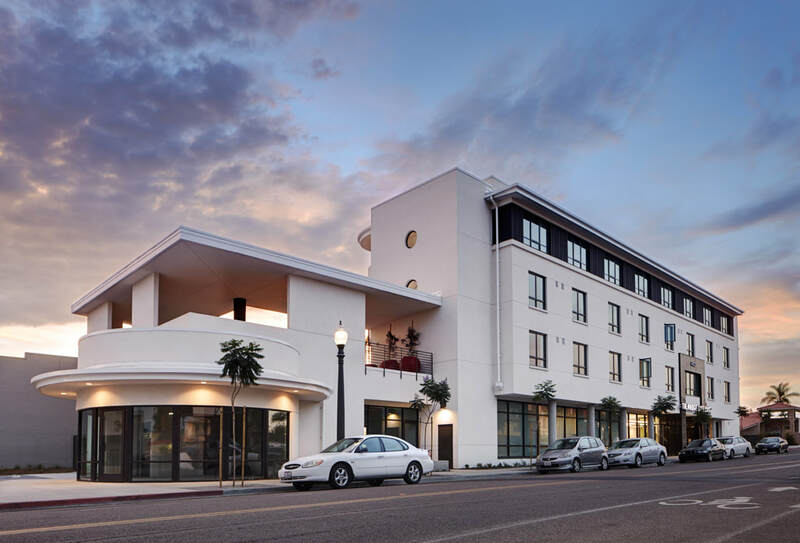 Talmadge Gateway is one of eight projects that are part of the San Diego Housing Commission’s $29.8 million homeless action plan Housing First — San Diego, which was launched in 2014 to create 407 permanent supportive housing units for homeless San Diegans. Clients are referred from St. Paul’s Program of All-inclusive Care for the Elderly, a managed care health plan more commonly known as PACE. Pastore, a former brick layer, said he wasn’t able to walk two years ago, and in 2012 he was diagnosed with arthritis in his back and a compressed disc. After a stint in the San Diego Rescue Mission, he was staying at Connections Housing downtown about five months ago when he got a call out of the blue asking if he’d be interested in his own place. Carol Hubbard, executive director of Home and Community Services for St. Paul’s Senior Services, spoke at the opening ceremony about the need for the project. This year’s count of homeless people in San Diego County found, 5,621 people unsheltered and 3,495 in shelters. Other speakers including State Sen. Toni Atkins and Assemblyman Todd Gloria, who urged people to contact legislators to ask for support of Senate Bill 2, which would provide $250,000 annually for projects like Talmadge Gateway; SB 3, a $3 billion bond for affordable housing; and SB 35, which would speed up such projects. The opening ceremony was held on the terrace atop the white, four-story building near the corner of Euclid Avenue and El Cajon Boulevard. Gloria said it is important that such housing projects enhance the community because quality, attractive projects will encourage more communities to welcome them. “That takes us a step closer to solving this terrible housing crisis we live in,” he said. Talmadge Gateway was the second of eight projects identified in the Housing Commission’s homeless action plan. The first, the 62-unit Cypress Apartments in the East Village, opened Monday and serves chronically homeless and disabled homeless people. Construction is underway for the Nook East Village, another project in the plan, which will have 90 affordable units including 8 dedicated to permanent supportive housing for the homeless. Ground-breaking for another project, Vista del Puente, is scheduled for Aug. 3. It will include 51 affordable units, with 38 dedicated as permanent supportive housing. Talmadge Gateway was built by Wakeland Housing and Development Corporation, which has built 6,500 affordable units at 40 properties throughout the state. Funding for the $4.8 million Talmadge Gateway came from a variety of sources, with $2.6 million from the U.S. Department of Housing and Urban Development, $1.2 million from the city of San Diego’s Inclusionary Housing Fund and $1 million from the California Local Housing Trust Fund Grant. Talmadge Gateway is guaranteed to remain affordable for 55 years. Residents are chosen from PACE, and their rent is based on one-third of their income. Pastore said he feels much better and is not in pain anymore thanks to treatment provided by PACE. His treatment is ongoing, and PACE provides rides to clinics as part of the services provided in the housing project. As someone who loves to cook, Pastore said one of the best improvements to his life has getting his cookbooks out of storage and having his own oven and stove.